Note: This product is not compatible with the second edition rules. 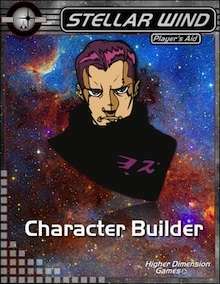 Character Builder is a Stellar Wind Player’s Aid. Player’s Aids are small works that provide useful tools for both GMs and players. This aid consists of three spreadsheets that will automatically generate an NPC of any Race and Background. One sheet is in Excel format for Windows users who have Excel 2007 or later, one is in Numbers for iPad format, and one is in Numbers format for Mac users who have iWork 09 or later. The iPad and Mac spreadsheets will fill out a character record sheet for you when generating the NPC. Included is a readme file giving instructions and tips on using the spreadsheets. This title was added to our catalog on September 06, 2011.